Georg Bocskay and Joris Hoefnagel never met, but they collaborated (or more likely competed) on a masterpiece: Mira Calligraphiae Monumenta . Born in Hungary (today Croatia), Bocskay was secretary to the Holy Roman Emperor Ferdinand I, and in 1561 to 1562, he demonstrated his preeminent skill in calligraphy by compiling the Model Book of Calligraphy . Bocskay wasn't trying to pass along meaningful knowledge so much as show off. Whether he intended to have his work illustrated is not certain, but a scribe penning the script, and an illuminator subsequently adding pictures had been standard practice for centuries. Still, Bocskay probably couldn't anticipate the whimsical approach that would be taken 15 years after his death by the learned illustrator Hoefnagel, perhaps Europe's last great illuminator. The son of a diamond merchant, Hoefnagel learnd the value of a practiced eye early on, and aimed "to demonstrate the superior power of images over written words." By the time Hoefnagel began illuminating the calligraphy book, around 1590, Ferdinand's son Maximilian II and grandson Rudolf II had made the Bohemian court, which Rudolf moved to Prague, one of the principal centers of 16th-century botany. In addition to his gardens, Rudolf also assembled a famous Kunstkammer, a vast collection of fossils, bones, minerals, and scientific instruments. Rudolf became famous throughout Europe for his curiosity about the natural world, and almost as famous for his persistent melancholy. His low moods were no doubt worsened by frequent attempts to depose him. Even his own brother tried to force him from the throne (and eventually succeeded), yet he somehow summoned the will to both stay in power for years, and support the arts and sciences. Some historians actually suspect that the monarch's passion for collecting was an attempt to counteract his depression, and without his bouts of despair, the collections might not have existed. Hoefnagel gave many of the objects he illustrated a three-dimensional quality by illustrating their shadows on the page. The stems of some plants he illustrated appeared to pierce the page, with the stalk appearing on the reverse of the page to complete the illusion. Hoefnagel's fondness for illustrating flowers was a sign of the changes wrought by the Renaissance; in medieval times, greater value had been placed on medicinal herbs, prized for their practicality. Ferdinand I, Maximilian II and Rudolf II all cared deeply for their gardens. 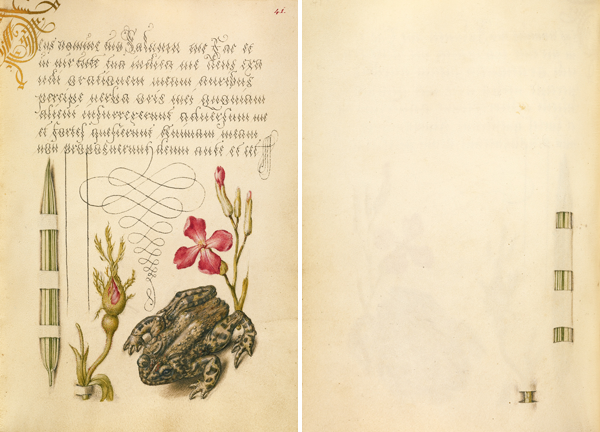 Drawing from the gardens of Rudolf II and from images by other artists, Hoefnagel decorated the calligraphy manuscript with flora and fauna that were both real and fanciful. Up to that time, most manuscript decorations had been pure fancy, so those who perused his work must have enjoyed identifying things they had actually seen in real life. At the same time, however, plants and animals were prized for what they symbolized, and pictures such as Hoefnagel's were generally loaded with meaning that might escape a modern viewer. He illustrated for Rudolf at a time when the natural world was just started to lose some of its traditional symbolism. Naturalists and artists were starting to look natural objects for what they were, not what lessons in morality they could impart. Besides flowers, Hoefnagel cared quite a bit about bugs. His illustrations gave particular prominence to insects, and he was one of the first European painters to do so. When he and his son Jacob published engravings of insects, they were among the first entomological illustrators. Bound to the back of Mira Calligraphiae Monumenta was a work Hoefnagel completed by himself: two sets of letters, one of Roman capital letters and one of Gothic lowercase letters. Although the miniatures surrounding each letter were mostly fanciful, the illustrator chose a more dignified tone designed to honor Rudolf II. By Hoefnagel's time, Gothic letters were considered barbaric. Perhaps to match the barbarism of those letters, he illustrated more bizarre hybrids, with a sometimes funny, sometimes creepy face at the center of each page. He remained realistic, however, in depicting birds, dogs, and monkeys. Mira Calligraphiae Monumenta was produced at a time when printing had overtaken writing in the production of books. The work was a bit of an anachronism in that it not only relied on calligraphy created by hand, but also emphasized the preservation of information — rather than its dissemination — with luxurious materials like gold, silver and vellum, rather than cheap ink and pedestrian paper. The rise of the printing press did, however, give skilled scribes a new artistic status. Something else that distinguished Bocskay and Hoefnagel's book was its minute size, with pages just over a few inches wide. Mira Calligraphiae Monumenta might not be considered rigorous science by today's standards. Dead frogs don't pose as nicely Hoefnagel drew them, nor do butterflies sport such beautifully curled proboscises. Modern identifications of Hoefnagel's creatures often include the term "imaginary." Yet his illuminations helped mark the beginning of serious study. The beauty of the work speaks for itself.